It seems every season in the NHL a handful of goaltenders come out of the woodwork to have exceptional seasons out of nowhere. Whether they emerge from junior hockey, the AHL, or from a backup position, a handful of netminders have found unlikely success this season. 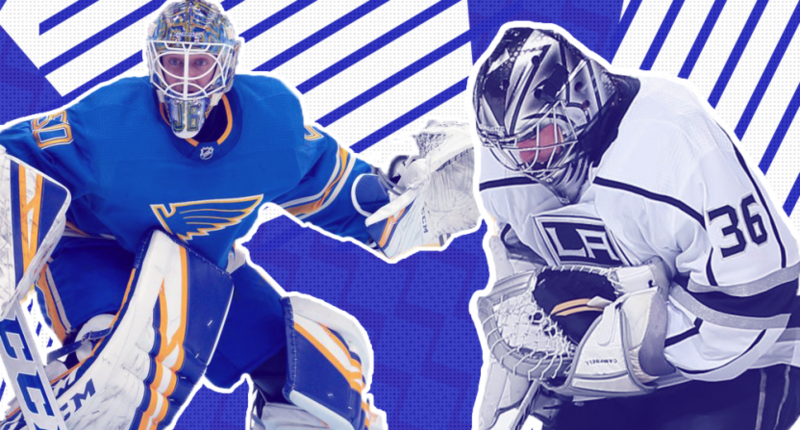 Here are five of the biggest out-of-nowhere goalie performances in 2018-19. St. Louis’ season appeared to be lost back in early January after the team fell three games under .500 at 16-19-3. Then, the Blues called up Binnington and didn’t look back. Binnington’s numbers are eye-popping since his callup. In 32 games, the rookie netminder has gone 24-5-1 with 1.89 goals-against average and .927 save percentage. In five-on-five situations, Binnington has excelled with a league-leading .941 save percentage among goalies who played in at least 20 games. His stellar play between the pipes pushed the Blues from a mediocre squad into playoff contenders. While Vancouver Canucks center Elias Pettersson has the Rookie of the Year award locked up, Binnington’s late-season surge has put him in the conversation. Not bad for a rookie who entered the season on a two-way contract. The Coyotes were dealt a tough hand when starting goalie Antti Raanta went down with a season-ending lower body injury in late November. Fortunately, Keumper picked up the slack down the stretch and turned in a surprisingly great season. Arizona might have barely missed the playoffs, but it was not because Keumper wasn’t playing like a number one goalie. After playing 19 games split between the Kings and Coyotes, Keumper played 55 games in 2018-19 with a 27-20-8 record, 2.33 goals against average and a .925 save percentage. The 28-year-old career backup was even better down the stretch, as he posted a 1.74 goals against average and .944 save percentage in March and April. Keumper’s previous career high in games played was 31. This season, he looked like a NHL-caliber starter. Campbell was a highly regarded prospect after getting drafted 11th overall in the 2010 NHL Entry Draft by Dallas. Unfortunately, he never seemed to meet his potential, appearing in just one NHL game with Dallas before getting traded to the Kings in 2016. Since then, Campbell has toiled in the AHL with occasional NHL spots starts. Until this season, where he finally found success at the big league level. After starter Jonathan Quick went down early in the season with a knee injury, Campbell stepped in and played great before getting sidelined with his own knee injury. When he returns in January, Campbell assumed the backup role behind Quick and proved he belonged at the highest level. In 31 games, Campbell posted a 10-14-1 record with a 2.30 goals against average and a .928 save percentage. He might not be a starter long-term in the NHL, but for a guy who was once considered a bust, being a good backup is impressive considering his trajectory. In 2018-19, the Flyers broke a record for using eight different goaltenders through the season. Out of all of those goalies, Hart has stood out the most. At 20, Hart was thrust into the NHL despite having just 18 AHL starts to his name. He responded by looking like a seasoned veteran, including leading an eight-game winning streak between January and February which propelled the Flyers back into the playoff race. While Philadelphia ultimately missed the postseason, they got a glimpse of how good Hart could be. In 31 games, he finished with a 16-13-1 record with a 2.83 goals against average and a .917 save percentage. Hart looks ready to assume the number one role next season. Rittich might not be the starter for the Flames entering the playoffs, but his first full season as an NHL regular was a success. Rittich was stellar right out of the gate for the Flames, winning 19 of his first 27 starts. He appeared to have a lockdown on the starting job for Calgary, but as the season progressed, his numbers dipped and Mike Smith took over in a 1A, 1B situation. But, taking a look at his deep numbers, Rittich looks like the better goalie. He has posted a .929 save percentage in all even-strength situations, where Smith is at just .900 there. Even if he is technically a backup, Rittich going from 23 career games to a 27-9-5 record, a 2.61 goals against average, and a .911 save percentage is pretty solid, all things considered.